Stores reference 15A/141. Two point detachable chest pack. Attaches to the harness by the engagement of a pair of steel loops fitted to the pack to a pair of hooded snap-hooks located on the chest. This example is manufactured in the less common and slightly lighter weight/darker chocolate coloured plain weave cotton. 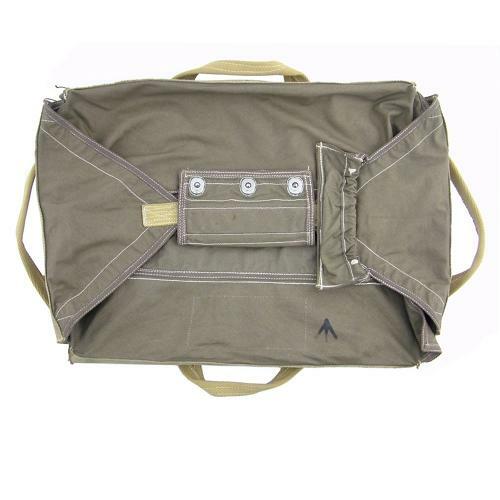 It is complete with all the webbing grab handles, rip-cord flap and rip-cord handle housing. We originally sold this 11 years ago and recently re-purchased it. The pack is in excellent, probably unissued condition but lacks the label, having only a single broad arrow stamp. Pack only - no canopy, metalwork, ripcord or bungees. Packs are now becoming increasingly difficult to source. Stock code M23398.